For Leg 3, we returned to Oakland on Sept. 22 and began work immediately. Not only were there necessary boat tasks to complete before leaving, but we also had to find a new insurer and modify the boat to meet their requiremens, but to enure that we satisfied the requirements for cruiser's insurance (Allstate does not insure vessels outside of Canada or the US) we needed a new boat survey. Items such as smoke and carbon monoxide detectors, extra fire extinguishers needed to be purchased and installed prior to the survey. When our tasks were complete, the survey done, and we were insured, we headed Wings south again, taking a few weeks to reach San Diego. We were enrolled in the 2011 Baja Haha for a rally/trip to Cabo San Lucas, MX. To help us along and to share the fun were two very experienced blue water sailors, Jerry and Nancy Wertzbaugher. A few years before, we had spent a week with them aboard their Hylas 49 in the Caribbean, so knew their expertise. We were very excited to have such experienced sailors on board. They also were two of the most easy-going people that we've ever met. Four adults living on a forty-foot boat is fraught with difficulty, but we ended the twelve days as better friends than we began: at least we think so. The Baja-Haha rally had three legs. 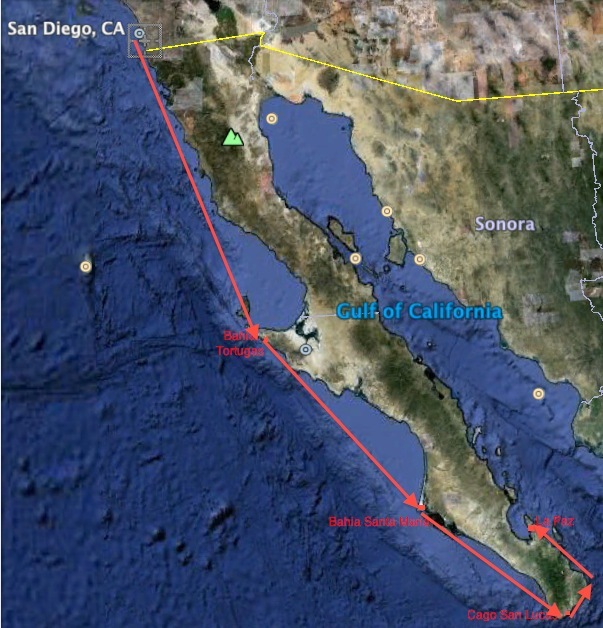 San Diego to Bahia Tortugas, Bahia Tortugas to Bahia Santa Maria, and Bahia Santa Maria to Cabo San Lucas and the finish line. From Cabo, we took our own route to La Paz. After a few days cruising in the Sea of Cortez, we enjoyed some time in La Paz with the remainder of the Baja Haha fleet. Of course, we had to find a place for Wings to over-winter and we prefered that it be on land. Wings had to be prepared for the Baja winter season, and that did not include draining all her fresh water as we did in Alaska! After she was prepared for us to leave her, we took a bus to Cabo San Lucas to spend a few weeks relaxing in our time share, then return home. On return to Mexico (Leg 4), we will stay and cruise in the Sea of Cortez for a year. Past Leg 4 is a bit obscure: do we head south and around into the Caribbean, or join the Pacific Puddle Jump to French Polynesia?